Experts advising the government have said there is not enough scientific evidence to warrant a ban on the sale of energy drinks to children. The MPs recommended more prominent labels, saying the drinks were not suitable for children. Critics said they were disappointed not to see a recommendation for a ban. A number of big supermarkets already ban their sale to under-16s due to concerns over the levels of sugar and caffeine in them. In August the government launched a public consultation into whether to make it illegal to sell energy drinks to children. Young people in the UK are the biggest consumers of energy drinks in Europe for their age group. Chairman of the cross-party committee, Norman Lamb, said they had heard a range of concerns which “varied from a lack of concentration in the classroom and hyperactivity, to the effects on physical health”. But the committee found there was “insufficient evidence” as to whether children’s consumption habits are significantly different for energy drinks than for other caffeinated drinks like tea and coffee. 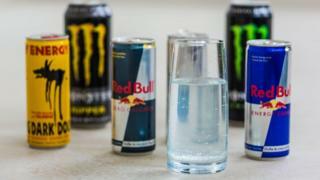 The MPs did find drinking energy drinks correlated with young people engaging in other risky behaviours such as drinking alcohol and smoking, but said it wasn’t “possible to determine whether there is any causal link”. The committee called on the Government to commission independent research to see whether energy drinks are more harmful than other soft drinks. The MPs also supported the idea of exclusion zones of sales to children around schools. They said that despite statutory labelling on energy drinks that they are not recommended for children, “a significant number of young people continue to consume these products, and some in excessive amounts.” leading to concerns that children and their parents do not fully understand what they are consuming. The committee said the Government should use the opportunity of leaving the EU to introduce additional – more prominent – labelling requirements on energy drinks. Professor Russell Viner, President of the Royal College of Paediatrics and Child Health (RCPCH) said it was “disappointing not to see a recommendation today to ban the sale of these drinks to children. The committee members said they had heard from a number of witnesses who argued that the low cost of energy drinks made them more accessible to children. Prof Viner said the Government should introduce “a minimum price for energy drinks as we know their cheap price tag is a key driver for their purchase”.